A CHICKEN BONE!!! If you know me at all, you know that I loathe meat on bones with all my being. I had to expend a lot of energy in making sure my easily offended eyes didn't look at the purpley, gristly bone any longer than necessary - save, of course, to take this blurry, indiscernible photo. 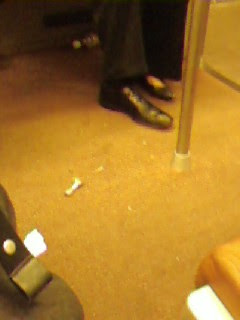 And most importantly, who eats chicken on the Metro??? OMG! that is so gross! And, I couldn't imagine that being on the ground! This past fall when we went to see the Wizard of Oz, I ordered something I never order; pork! Well, when it was served; it was still on the bone; like it's ribs or something. Holding my breath, I lietrally switched plates with Sean and was like; can you please take it off the bone for me. He, being the great guy he is; cut up my food and took the bones for him to put on his side of the table. Needless to say; it was still hard to eat.